HRBSE-107 | Size: 50 ml / 1.69 fl.oz. Supports natural cell regeneration, nourishes, softens wrinkles, reduces acne scars, age and sun spots. Suitable for dry and mature complexions. 99% natural ingredients, chemical-free formula. This intensive anti-wrinkle balm cream is designed for dry, wrinkled, irritated, flaked or skin affected by pigmentation. Decreases deep wrinkles, scars, unifies the skin color, while calming, hydrating, nourishing and smoothing the aging signs. The new, improved formula is rich in allantoin, glycolic acid, collagen and elastin and enhanced with valuable ingredients of natural origin or organic certified. 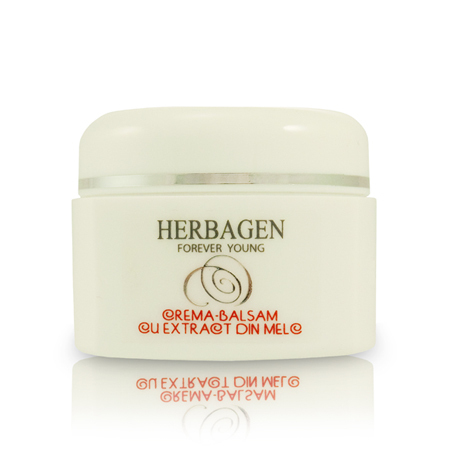 For faster and more visible results combine with the Herbagen Snail Extract Repair Serum. Using this secretion the snail is able to regenerate its shell or skin which is constantly damaged due to its movement on the ground, or other aggressive factors. Poly-Helixan's composition is high in restorative, complex ingredients: allantoin, proteins, vitamins A, C, E alphahidraxyadicds, mucopolysaccharides,proteolytic enzymes, collagen and elastin. INGREDIENTS: AQUA, HELIX ASPERSA SECRETION/POLYHELIXAN, RICINUS COMMUNIS (CASTOR) SEED OIL, HYDROGENATED CASTOR OIL, COPERNICIA CERIFERA (CARNAUBA) WAX, BEESWAX, OLIVE OIL (OLEA EUROPAEA FRUIT OIL), GLYCERIN, GLYCERYL STEARATE, CETEARETH 20, CETEARETH 12, CETEARYL ALCOHOL, CETYL PALMITATE, CETYL ALCOHOL, SODIUM CETEARYL SULFATE, ARGAN OIL, PERSEA GRATISSIMA OIL (AVOCADO OIL), VITIS VINIFERA (GRAPE) SEED OIL, SIMMONDSIA CHINENSIS, TOCOPHERYL ACETATE, SODIUM BENZOATE, POTASSIUM SORBATE, PHENOXYETHANOL, PARFUM, ALPHA-ISOMETHYL IONONE, BUTYLPHENYL METHYLPROPIONAL, CITRONELLOL, EUGENOL, GERANIOL, HEXYL CINNAMAL, HYDROXYISOHEXYL 3-CYCLOHEXENE CARBOXALDEHYDE, LIMONENE, LINALOOL, ETHYLHEXYLGLYCERIN, ALLANTOIN, TOCOPHEROL, EDTA, CANANGA ODORATA. Glycolic acid - Has a peeling effect on skin. BIO Sangre de drago tree extract. Avocado, grape seed, vegetable oils. Rich cream. Like the tightening cream better. exquisito aroma y textura, muy hidratante, recomendable 100%..